4 Bedroom Detached House For Sale in Preston for Asking Price £550,000. An opportunity has arisen to purchase one of Fulwood's finest four bedroom contemporary detached homes, simply feeling full of character as soon as you step through the door, it is a home that exemplifies the very nature and prestige of Garstang Road, having been cherished and cared for by the same family for numerous years. The attention to detail can be seen in every room with each room flowing effortlessly to the next. The exceptionally well proportioned accommodation comprises of an imposing vestibule leading into a gorgeous reception hallway with staircase leading to the first floor. The bespoke bright fitted breakfast kitchen has a host of integrated appliances including a washer/dryer, fridge/freezer and cooker. Adjoining the breakfast kitchen is a family room perfect for additional living and entertaining the family. The spectacular family living in this property sees the living room provide a dual aspect to the front and rear, a gorgeous electric fire whilst mirroring this, there is a further reception space, ideal for a large family. There is also a ground floor WC and shower room facility. Upstairs, you will find four luxurious double bedrooms, the master bedroom benefitting from its own dressing room and luxury en-suite bathroom and shower. There is also a luxurious five piece main family bathroom. The whole property is gas central heated, double glazed and provides a secret addition of a self contained one bedroom annexe comprising a lounge, kitchen, bedroom and bathroom. 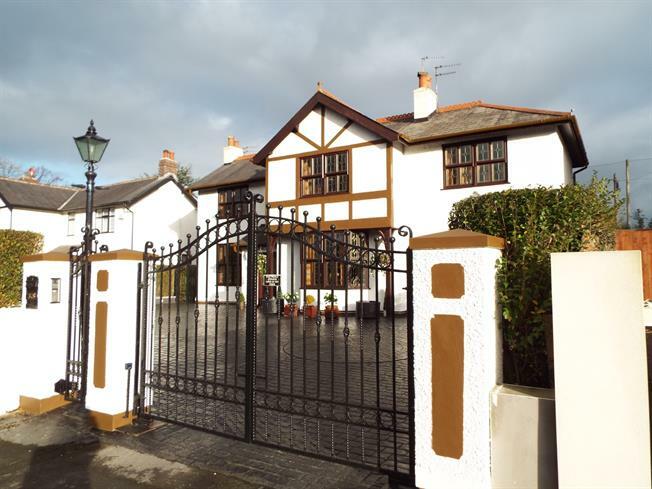 Outside, the property is approached via a secure intercom electric wrought iron gates into a large hard-standing driveway and access to a double integral garage. The ground surrounding the home are low maintenance, patio paved with a seating area and mature hedging keeping the boundary private. Viewing is to be strictly considered and is highly recommended. Hardwood entrance door with leaded glass panels, dado rail, original coving, tiled flooring and meter cupboard. Hardwood entrance door with stained glass panels. Radiator, wooden flooring, dado rail and picture rail, original coving. Spindle staircase leading to the first floor. Dual aspect; Double glazed hardwood stained glass windows facing the front and rear. Radiator and electric fire with marble surround, wooden flooring, dado rail and picture rail, original coving. Double glazed hardwood bay window facing the front. Radiator and gas fire with tiled hearth, wooden flooring, dado rail and picture rail, original coving. Radiator, tiled flooring, dado rail and picture rail. Wooden sliding double glazed door, opening onto the garden. Double glazed hardwood window facing the rear. Radiator, mosaic tiled flooring, tiled splashbacks. Roll top work surface, a range of high gloss red fitted wall and base units, kick board lighting and under unit, stainless steel one and a half bowl sink with drainer, integrated electric oven, gas hob, stainless steel extractor, integrated washing machine, dryer, fridge, freezer. Mosaic tiled flooring, tiled walls. Low level WC, vanity unit. Hardwood window facing the side. Mosaic tiled flooring, extractor fan. Wet room with chrome mixer rain shower. Hardwood window facing the side. Split level landing; Hardwood stained glass windows to the front and rear aspect enjoying views over the cricket grounds. Radiator with decorative cover, picture rail, dado rail, carpeted flooring. Double glazed hardwood stained glass window facing the front. Radiator, carpeted flooring, dado rail and picture rail. Heated towel rail, tiled flooring, tiled walls. Low level WC, jacuzzi, double enclosure shower, twin sinks. Double glazed hardwood stained glass window facing the front. Radiator, vinyl flooring, picture rail. Double glazed hardwood stained glass window facing the rear. Radiator, carpeted flooring, dado rail and picture rail. Double glazed wood velux window facing the side. Radiator, carpeted flooring, under the eaves storage. Double glazed hardwood stained glass window facing the side. Heated towel rail, tiled flooring, tiled walls. Low level WC, jacuzzi, double enclosure shower, twin sinks, extractor fan and bidet. Wooden double glazed door. Radiator, laminate flooring. Double glazed hardwood window facing the side. Radiator, tiled flooring, tiled splashbacks. Roll top work surface, fitted wall and base units, stainless steel single sink, electric oven, gas hob, space for washing machine, fridge/freezer. Double glazed hardwood window facing the side. Radiator, laminate flooring. Double glazed hardwood window facing the side. Heated towel rail, tiled flooring, tiled walls. Low level WC, panelled bath, shower over bath, pedestal sink. Double tandem garage with electric door, power, lighting, a wall mounted combi boiler and rear entrance door.